A cone is a solid bounded by a conical surface and a plane which cuts the conical surface. It may be considered as a pyramid with an infinite number of sides, Fig. 80. The conical surface is called the lateral area and it tapers to a point called the vertex; the plane is called the base. The altitude of a cone is the perpendicular distance from the vertex to the base. An element of a cone is any straight line from the vertex to the circumference of the base. A circular cone is a cone whose base is a circle. A right circular cone, or cone of revolution, Fig. 81, is a cone whose axis is perpendicular to the base. It may be generated by the revolution of a right triangle about one of the legs as an axis. A frustum of a cone, Fig. 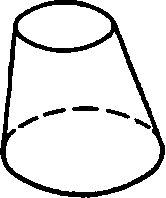 82, is the portion of the cone included between the base and a plane parallel to the base; its altitude is the perpendicular distance between the bases. Fig. 81. Right Circular Cone. Fig. 82. Frustum of Cone.